Up will make you laugh, it’ll make you cry. And, that’s just within the film’s first 15 minutes. It only takes that long for Pixar Animation to provide one of the most affecting sequences of cinema this year: The meet-cute between childhood sweethearts Carl Fredricksen and fellow explorer-at-heart Ellie, followed by a wordless montage tracking their wedding and lifelong love affair, including their inability to conceive or realize their dream of becoming world travelers but rich with content memories as their grow old together, eventually concluding with Ellie’s terminal illness and sad passing. It’s a kindler, gentler Revolutionary Road. And, if the closing credits rolled then and there, Up would already be one of the year’s best films. When the elderly, widowed Carl (Ed Asner) – drawn and voiced to resemble a sexagenarian Spencer Tracy – faces encroaching urban sprawl and involuntary relegation to a retirement home, he decides to follow through on he and Ellie’s promise to one day journey to the wilds of South America and literally plant their fixer-upper dream home atop the mystical Paradise Falls. So, Carl does what any normal person would do: he raises the manse from its moorings into the stratosphere using hundreds of multicolored, helium-filled balloons. Joined by a stowaway junior wilderness explorer, Russell (Jordan Nagai), they float south until setting down a three-day’s sojourn shy of the falls. As both helium and time seep away, Carl wraps a garden hose around himself in order to keep the house from floating off and trudges the remaining distance, literally tethering himself to a memory. Indeed, it is significant that, late in the film, Carl cannot realize life’s truest adventure – the aid and comfort of loved ones – until he literally jettisons the dead weight of the past and leaves it sitting at the edge of a paradise lost. In the Venezuelan jungles, Carl and Russell encounter the typical animated diversions, including a giant technicolor bird named Kevin and canines who can talk, fly airplanes during aerial (ahem) dogfights, and, yes, play poker. 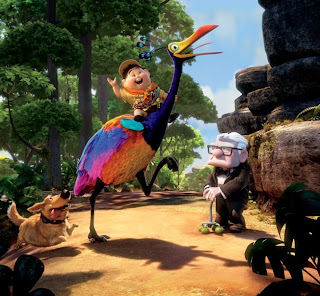 There is also Carl’s childhood hero, the Lindbergh-esque explorer Charles Muntz (Christopher Plummer) with his motto “Adventure is out there.” Defrocked by the scientific community years ago, Charles has lived in exile ever since in hopes of one day salvaging his reputation by capturing the rare fowl Kevin. Cliffhangers and action sequences ensue aboard and around Carl’s flying two-story and Charles’ mammoth dirigible. In the end, Up is about longing: a man for his wife, a boy for his father, and a bird for its family. Ultimately, Carl learns that adventure is not necessarily “out there,” but rather may be closer to home, both physically and conceptually. Although not among Pixar’s most sensorially whiz-bang entries and susceptible to the lure of stereotypical animated conventions during its second half, director John Docter (Monster's Inc.) creates a film that is visually sublime and certainly one of the studio’s most mature and complex offerings. Make no mistake: The laughs come early and often enough to please young ones. Its soul, however, is more attuned to those yearning to once again feel young at heart.